X-O Manowar is being relaunched as the flagship title for the newly revamped Valiant Comics. Back in the 90s, Valiant was one of the stronger of the influx of new independent publishers that were popping up due to the strong stories they were producing, but as with all good things, their time came to an end. Last year, Valiant was rekindled and started fresh, rebooting some of their more popular titles from the 90s, and my local comic shop was running a deal for the first volume of X-O Manowar and Harbinger for $5 each, so I thought I'd give them both a try. Aric, heir to the Visigoth throne, has been battling against the armies of the Roman Empire until he and his men are captured by an alien race to be used as slaves. 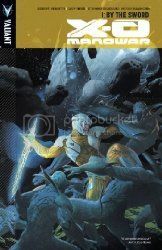 After years of being subjugated by the alien race, Aric leads an uprising on their ship which leads him to accidentally activating the aliens' greatest weapon, the X-O Manowar armor, which they have yet to successfully harness. After he destroys the alien ship, he uses the armor to fly back to Earth, where he lands in modern times. And that's basically all that happens. Don't get me wrong. It was a good start to a story, but to be using this as the flagship title for their reboot was a poor choice, in my opinion. There just wasn't much to this story. I'll be picking up the next collected edition when it is released, because there is definitely the potential for some great storytelling here, what with Aric having to come to terms with being out of his own time as well as learning how the armor operates. Bibliopunkk is like a phoenix!